To exploit this glitch, throw a grenade at a boss (or other enemy) and while the grenade is exploding and causing damage (enemy will be flashing red/white), pause the game. While everything on the screen freezes, the grenade remains active, continuing to cause damage to your target. After some time (keep it paused for more damage), you can unpause the game to fatally kill the enemy. This glitch only works on the bosses for levels 2, 4, 6, and 7. The demo that plays during the starting screen (by not pressing anything) shows Jason fighting two of the game’s bosses. If you beat the game and watch the demo again, the bosses to not appear in the demo, Jason will be shooting at nothing. This is presumably due to you actually killing those bosses in the game. Unknown Causes: Under certain circumstances, the music in the game can become glitched by adding random sound effects in with the music mix. This may have to do with a glitch involving pausing the game. Unconfirmed: Use the Thunder Break then rapidly press pause and unpause the game, this will produce broken thunber bolt graphics on the screen if done fast enough. 1. Unconfirmed: Missing Information: If you press the opposite direction at the exact right time when entering a door. 2. Getting hit and damaged at a certain angle touching a wall. 3. Use the Crusher to shoot some destroyable blocks, drive into the area where the blocks were, exit the vehicle, pause the game. The blocks now will be regenerated and you will be stuck. Depending on the circumstances and where you got stuck, it may be possible to jump and move your way out, but more commonly you will be stuck permanently and will have to reset your game and progress. Unconfirmed: If you jump, pause, then jump again in mid air, you can do a double jump. You can repeat these steps over and over again to go even higher. Unconfirmed: Missing Information: If you exit the level 1 (and possibly others?) boss room at the right time, the player will return to the previous screen, but you will continue the boss fight. What ends up happening is the game doesn’t have a chance to get the boss sprites or background textures loaded, so some very intense graphical glitches occur as the game tries to load whatever it can in place of the normal sprites. After the battle is done, the graphics return to normal. Unconfirmed: If you quickly pause and unpause the game at the exact right moment when entering another room, you can bypass the lengthy scrolling transition between each room, shaving precious milliseconds or even seconds? which is useful for speed-runs. Unknown Causes: Missing Information: While fighting the boss using the fully powered up gun, according to the video poster, the music became glitched and after the boss was killed, he still continued to fight. It is unclear if the weapon caused this glitch or if the monster would of continued to fight while dying if it was left alone. I’m planning on testing all the unconfirmed glitches in this game this weekend. I was wondering about the “stuck in wall glitch”. By “opposite direction” are you referring to the button you push to enter the door? 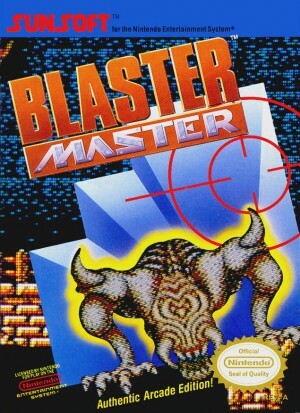 Which would then mean the opposite direction would be up I believe (I might be wrong I haven’t played Blaster Master in a while). I’m not exactly sure myself. There’s a lot of questions about that one to be honest. I believe the source is referring to going into a north facing entrance (up), then going south at the right moment (down). I just added a couple more unconfirmed glitches for you too (these are emulated which is why they need to be confirmed). I want to give a special shout-out to flyingerasehead for supplying two new glitch documentations for this page! Got an unconfirmed glitch for you- if you press start to begin a game at the right moment, the game will not show you your lives and if you try to pause the game you will end up back at the title screen. I’ve done it by accident several times as a kid but can’t seem to figure out the right timing for it.